Oh My Gosh! I can't believe the summer holidays! The first part seemed to consist of lots and lots (and lots) of tantrums and made me feel like a complete and utter failure, no matter what I tried, this time round, I am just not enough to entertain both my children - my usual fail safes didn't work and I felt daunted by the prospect of the whole summer - where before schools out, I couldn't wait for it all to begin! But then as we picked up the pace and conquered the battles we started to really enjoy the holidays and I didn't end the day sat on the bathroom floor in tears feeling like a failure anymore - we were on fire! ... but with all the fun came the denial of the inevitable school supplies shopping trips and the weeks went from dragging to flying - so here is my last min dash list! The best stationery - Wilko's - (totally saved me!) 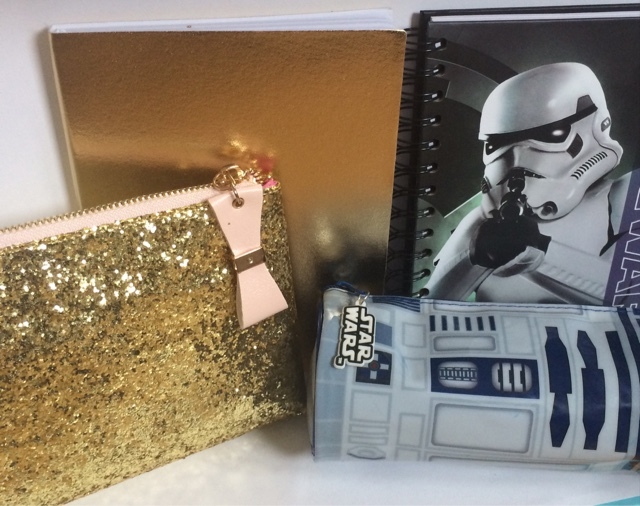 Metallic gold note book with gold glitter pencil case, Storm Trooper note book with an R2D2 pencil case that makes sounds - oh yes! - hero product! 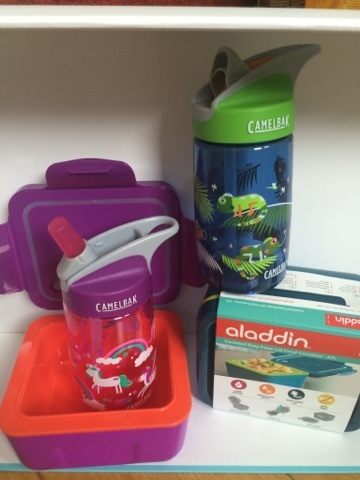 New water bottles by CamelBak - these are of super quality and really last well - and the rubber spouts are replaceable! Meg went for their new Unicorn print whilst Blake picked out the Iguana! We've also opted for Heat retaining Insulated Aladdin Easy-Keep lid food container - Meg made me test these out with porridge! - No leakage and was still hot hours later! 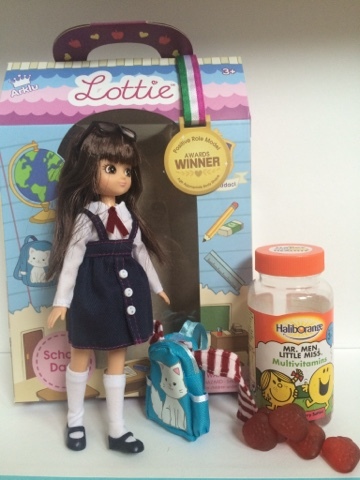 Everyone who knows me knows how much I rave about Lottie dolls - I love the pro girl messages - right down to the Suffrage ribbon on the boxes to the modelled on a real life 9 year old body image to the diverse choice of skin and hair tones. Gotta love the School Days Lottie - perfect for all the new starters or for those nervous about going back - I'm secretly hiding her until parents evening before the october break and hoping that Maegan gets a glowing report! I know she's going to love this one! And of course my list had to include a good multi vitamin - these Mr Men and Little Miss ones from Superdrug will hopefully help ward off all the inevitable cold and flu bugs that come with the start of the autumn term. They're like squishy strawberry gummy sweets so there is no fuss at all getting the kids to take one! What are your last min dashes or must haves? Disclaimer: This article contains some items provided for the sole purpose of the article, some are my own purchases, they are all items I would recommend whole heartedly - all thoughts, opinions, photos and link choices are my very own.